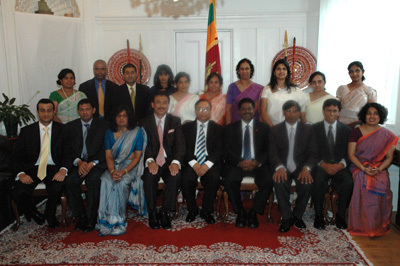 The Embassy of Sri Lanka in Washington DC held a religious ceremony to welcome the newly arrived Ambassador designate, Mr. Jaliya Wickramasuriya on Saturday, July 12, 2008 at the Embassy premises. 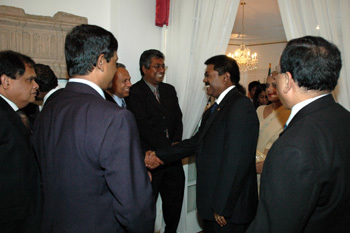 Mr. Wickramasuriya is the 15th Ambassador to represent the Government of Sri Lanka in Washington DC since its independence in 1948. Multi- religious observances were carried out by dignitaries from Buddhist, Hindu, Islam and Christian communities, who bestowed their blessings upon the Ambassador designate. Ven. Maharagama Dhammasiri Nayake Thero and Ven. 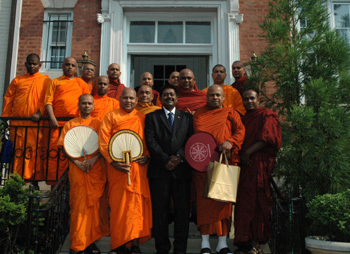 Katugastota Uparathana Nayake Thero, representing the Washington Buddhist Vihara and the International Buddhist Center in Wheaton, respectively, invoked Buddhist prayers. Mr. Selvaraj from the Embassy led the Hindu Prayers on behalf of Mrs. Kanaga Ranganathan, Mr. Seyed Ali Moulana, the Islamic prayers and Dr. Gregory Fernandopulle, the Christian prayers. 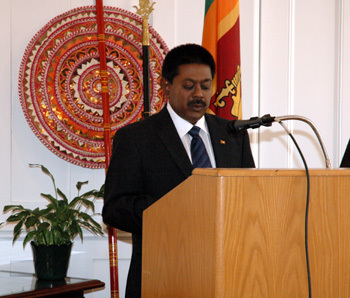 The welcome speech was delivered by Ambassador Tissa Wijeratne – Deputy Chief of Mission, introducing the incoming Ambassador to the Sri Lankan diaspora in the United States. The Ambassador designate, Mr. Jaliya Wickramasuriya emphasized in his speech that the support of members of the staff of the Embassy is essential to continue the work of the two countries in order to promote the image of Sri Lanka in the United States, and enhance trade ties between the two countries, for which, he also expected the fullest cooperation of the Sri Lankan expatriate community. He assured the attendees that he would continue the work which his predecessor Bernard Goonetilleke initiated, in addition to the work planned by him for the future. The event was attended by the Embassy staff, representatives of Sri Lankan American organizations in the Greater Washington area, as well as representations from a number of other states across the US.